The LL6 Progressive Cavity Pump is ideal for abrasive applications such as use in hydraulic fracking fluids and drilling mud pumping applications. 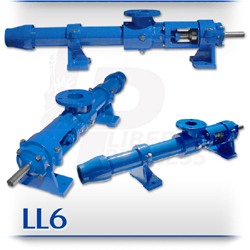 The LL6 is one of the most popular sizes for the L-Frame PC Pump by all pump manufacturers. It has a proven track record of excellence in pumping fluids and as a mud pump for platform installations. Liberty Progressive Cavity parts are direct aftermarket replacement pump parts for the *Moyno® L6 frame, *Tarby® TL6 frame and *Continental CL6 Series frame of progressive cavity pumps. Fracking and drilling mud pumps work under high-pressures with solids laden content, the LL6 can achieve flow rates from 0-47 GPM (5.20 Gallons per 100 revolutions) up to a top pressure of 225 psi. The LL6 is a standard flanged progressive cavity design manufactured in cast iron or 316 stainless steel casings and designed in 1, 2, and 3 stages for 75, 150, and 225 psi discharge pressures. Higher discharge pressures are available, please contact a Liberty representative for more information. The LL6’s simple hardened pinned joint drive assembly is a proven design that can handle the most difficult fluid pumping applications. The LL6 Rotors are typically tool steel or 316 stainless steel with a hard chrome plating for added durability and resistance to fracking fluids and the grit from mud pumping. All other wetted parts are either carbon steel or 316 stainless steel. LL6 Stators are available in many popular elastomers such as buna, natural rubber, epdm and viton. The standard seal design is a set of gland packing with Lantern Ring and flush connections. Mechanical seal options are readily available.